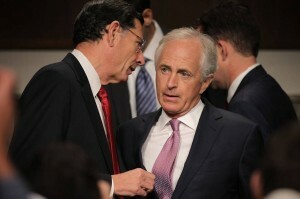 Republicans plan votes on new Tehran sanctions as Obama moves to lock up support to implement accord. Capitol Hill opponents of the landmark Iranian nuclear accord are devising a Plan B to ratchet up pressure on Iran as President Barack Obama moves closer to locking up the support needed to implement the deal. Critics of the agreement in both parties haven’t yet conceded defeat in the congressional battle next month, where they will push to derail the deal. But as their chances dim, they are preparing to push a rash of new legislation for the fall to increase sanctions on Tehran for its role in supporting terrorist organizations and militant groups active across the Mideast, which could cause Iran to back out of the deal. These politicians also are devising new ways to target the finances of Tehran’s elite military unit, the Islamic Revolutionary Guard Corps. “Iran has a long rap sheet, and I want to continue to prosecute Iran for its bad behavior,” said Sen. John Barrasso (R., Wyo. ), a member of the Foreign Relations Committee. The administration has vowed to continue challenging Iran’s terrorist activities and support of militancy, even after a nuclear deal is completed. But the fresh sanctions push has the potential to put the White House and leading Democrats, such as the party’s presidential front-runner Hillary Clinton, in a quandary. Those supporters of the deal could later face a tough decision over whether to back increased sanctions against Iran. There is growing concern in the White House that any steps viewed as imposing new sanctions could be seized on by the Iranian government to charge the U.S. with violating the nuclear agreement.